Sroyon Mukherjee is a PhD candidate in the Law Department at LSE. His research investigates the role of judges in the valuation of natural resources. He is currently President of the LSESU Beekeeping Society. 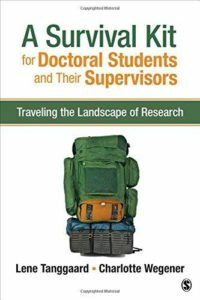 A Survival Kit for Doctoral Students and Their Supervisors: Traveling the Landscape of Research by Lene Tanggaard and Charlotte Wegener. SAGE Publishing. 2016. This review by Sroyon Mukherjee originally appeared on the LSE Review of Books blog and is reposted under the Creative Commons license (CC BY 3.0). How successful is their endeavor? Before addressing that question, I would briefly note that the book is different in at least two other ways. First, unlike most books in what may be called the ‘doctoral self-help genre’, Survival Kit addresses both students and supervisors. Second, the authors are both professors in the Department of Communication and Psychology at Aalborg University, but it turns out Tanggaard was Wegener’s doctoral supervisor, and this allows them to draw on a number of shared anecdotes and insights. The exposition, as is perhaps apparent from these excerpts, is couched in rather abstract terms which may be confusing – or worse, off-putting – for readers without a background in education theory. Nonetheless, it is an interesting premise. It draws on the work of Tanggaard and Wegener’s late colleague, Steinar Kvale, who argued for the extension of the apprenticeship paradigm to academic research. Kvale, in turn, was inspired by Lave and Wenger’s theory of situated learning, which may be defined as ‘learning that takes place in the same context in which it is applied’. Here, learning is seen not as a transfer of abstract knowledge from master to student, but as a product of ‘legitimate peripheral participation in communities of practice’ (Lave, 1991). But a book such as this must ultimately be judged on the quality of its advice; its theoretical underpinnings are of secondary importance. Accordingly, the practical implications of the apprenticeship perspective are explored in Chapters Two to Eight, which offer advice on a range of topics from choosing a supervisor all the way to finalizing the dissertation. Doctoral students are well accustomed to making sense of dense academic prose, but Survival Kit would be much more readable if the theoretical digressions and extensive references were dealt with in the first chapter, consigned to the endnotes or, in some cases, omitted altogether. On the other hand, some of the direct quotes (as opposed to paraphrased conclusions) are truly illuminating: ‘I write in order to learn something that I did not know before I wrote it’ (80, quoting Laurel Richardson). Success stories like that of Sven are typically more widely reported than stories of failure, so I was intrigued by Rasmus Birk’s account of being dismissed from a research position, from which the authors draw the heartening conclusion: ‘failure is not the end of the world’ (30). I for one would welcome the inclusion of more such stories and advice on ‘what not to do’, as a counterpoint to the book’s many positive narratives and constructive suggestions. This entry was posted in Bookshelf, Career and tagged Book Review, Doctoral Students. Bookmark the permalink. Post a comment or leave a trackback: Trackback URL.